Green tea leaves has been consumed and known for it's health benefits for over 3,000 years, although in America it may seem like it has only hit the spotlight in the recent decades. Unlike black teas and other varieties, green tea is made from unwilted and unoxidized leaves, which helps keep many of the enzymes and other healthy compounds in tact when you consume. Tea drinking has been a fundamental part of Chinese culture for centuries, with "tea ceremonies" becoming a part of daily practice. I myself drink tea daily and can see how the process of measuring your leaves, pouring hot water into your pot and letting it steep can be relaxing, cleansing and help you reconnect to your inner self in the midst of the busyness of the day. Green tea contains a compound called polyphenols which have powerful antioxidant properties. EGCG (epigallocatechin-3 gallate) is one of the most well known and studied phenols in green tea. EGCG has been shown to minimize oxidative damage to cells. Oxidative damage is now known to be one of the main causes of disease and aging. With green tea being 50 times more potent than Vitamin C you can understand why it is an amazing antioxidant to include in your diet! Green tea has been shown to prevent cancer and tumor growth and especially breast cancer. It may act by increasing the expression of progesterone and estrogen receptors on cells and prevent metastasis. Metastasis (spread of cancer from original site) is one of the main reasons breast cancer holds such a high mortality rate, studies have shown that preventing this with EGCG can help cancer patients with their fight against cancer (1). It also prevents DNA damage from it's antioxidant abilities and help increase activity of Glutathione, the most potent antioxidant created in your body. Unlike many other stimulating beverages, green tea offers more than simply caffeine. Green tea also contains an amino acid called L-Theanine. L-Theanine has been shown to increase the activity of the neurotransmitter GABA which helps create calming and anti-anxiety feelings. This can give you a much milder "buzz" from the caffeine not having as harsh effects on your adrenal system. Although this has not been proven yet, green tea may help you burn fat more efficiently. Some research has also shown that it may help increase your metabolic rate and expenditure, although the results from this may be more on an individual level and depends on how your body in particular responds to green tea and caffeine. If weight loss is a good and you are looking to support your body with a healthier diet, green tea can be an addition that just may help also boost your fat burning efforts! Drinking Green tea has been shown to prevent plaque build-up and prevent cavities! Unlike many other morning sugary drinks (I'm looking at you pumpkin spice latte), green tea can actually help your oral health and the overall health of your body. If you have read my recent post on the the importance of oral health in preventing disease, you will know that preventing cavities and periodontal disease is imperative to overall health. A Japanese survey of almost 1,000 men found that those who drank green tea regularly had healthier gums than those who didn’t drink the tea. Other Japanese research has also shown that you are more likely to hold onto your teeth longer and prevent having to purchase that set of dentures. Green tea is also anti-microbial, meaning it helps kill the bad bacteria that can lead to degradation of your teeth and gums but can also prevent bad breath! So next time you think about chewing on those sugary breath mints, maybe try a cup of tea instead. If you have been stuck in your coffee or black tea habit for awhile than I encourage you to give green tea a try. 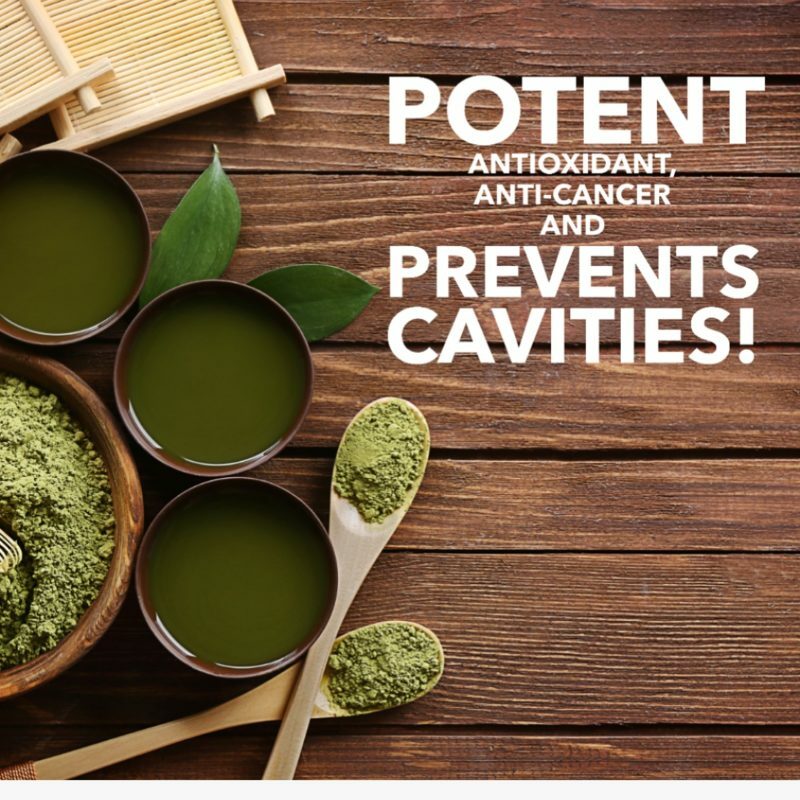 Some of these benefits stated can only be found when taking high doses of EGCG found in capsules but you can get daily benefit and disease prevention from simply starting your own daily tea ritual and sipping some of this delicious hot beverage.